Pie Safe’s were introduced by the Pennsylvania Germans in the 19th century. It was originally used to store pies and other baked good before the invention of the refrigerator which is where its name is derived from. The punched tin was traditionally used for ventilation to help keep the baked goods fresh. This reproduction piece will be a great addition to your colonial style home! This handsome single door Pie Safe with hand punched tin doors is handcrafted by the Amish. This pie safe has two adjustable shelves inside and a variety of tin options. 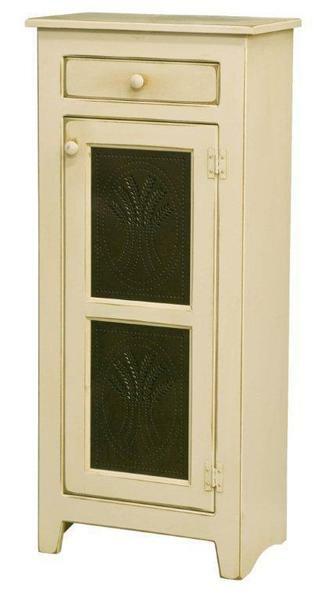 This antique look pine pie safe has decorative tin doors that add that special touch. Call to receive finish samples 1-866-272-6773.